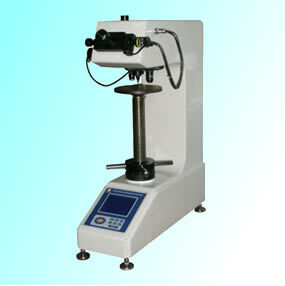 HVD Series program-controlled Vickers hardness have six models: respectively for 10 kg the manual and automatic Vicker's hardness tester, 30 kg manual and automatic Vicker's hardness tester, 50 kg manual and automatic Vickers's Hardness tester, is use computer software controls,the high magnification optical measurement system and photoelectric sensor technology implementation the diagraph equips and indenter automatically conversion,passing the software input,the strong or weak of the light source regulates automatically and choose Vckers's and Knoop's test、dwell time,document number and storage etc.,Offers a variety of hardness value of the conversion table for reference,In large-screen LCD screen can display test methods, test force, and measuring the length of indentation, hardness, test dwell time, measuring number and input year,month,date,experimenting the result handles with data etc.,pass the printer exportation. The tester is specially designed for testing minute, thin samples or parts after surface coatng or general mechanical part. For research institutes, factories labs and QC departments, Microscopic Vickers hardness test for better material microstructure and brittle hardness of measurement.this is an ideal hardness testing instrument for research or measuring purposes. 屏幕上 shows on the screen.